Sounds like a very productive day! Good idea on the media blackout. I vote just so I can comment LOL! I voted this afternoon - after procrastinating during the early voting days. Most of my state & local candidates won. Happy, happy, joy, joy. It will be interesting seeing how things work out. Lol I'm so glad to quadruple my cable bill tonight!! 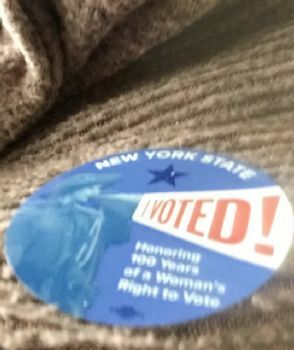 Our state sends out ballots and that is how I voted. It is nice for those who live rural to be able to vote without trudging into town! I am a firm believer in ...if you don't vote..don't comment. I am so grateful for the participation of informed citizens. Thank you, friend. Wishing you relief from this frustrating change in blood sugar regulation. I am grateful that you pay such close attention and practice such excellent self care. Glad you voted, and glad that you were able to walk the steep hill! We voted on the FIRST day of early voting! I'm a nervous wreck on the outcome and we will probably go out to eat after work and then rush home to see what the heck is going on. I'm praying for good results..I don't understand why people don't vote...but I guess it was never a big issue for us when we were much younger...now I actually study the candidates...you have to if you want to be informed! I'm so proud of you Chandra for exercising your right as a citizen and doing it when you walking everywhere makes it extra sweet. That was a LOT of energy and effort you put in...good on you!! You voted = can complain but at that point.....forget it. Have you taken a blood test to see if you are low on iron? It was the cause for me, so I took iron pills and then 8 wks after, had another test and it is normal. LOL, well as normal as can be. Yay! Thank you for exercising your right to vote!